Swig Sugar Cookies Recipe - from Bake.Eat.Repeat. The best sugar cookies I’ve ever made – or eaten! 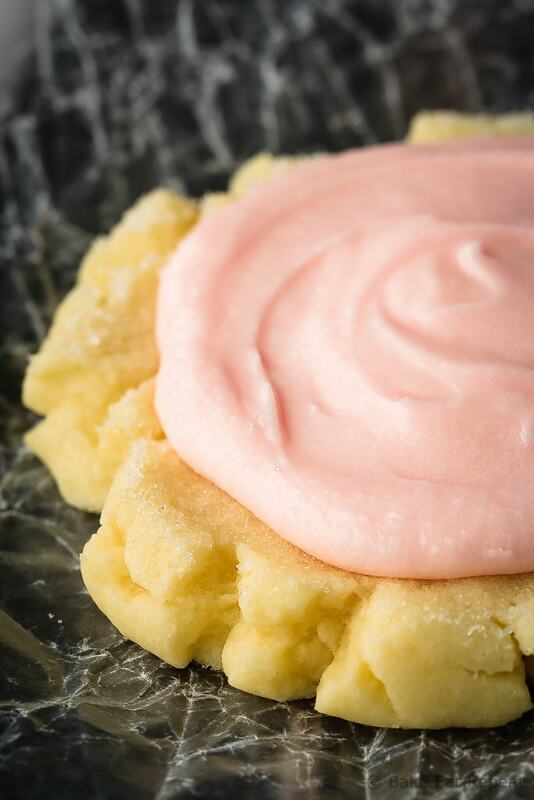 This copycat Swig sugar cookies recipe is fast and easy and the cookies stay super soft. They’re amazing! But I had never had a Swig sugar cookie before now. This copycat Swig sugar cookies recipe may just have converted me to someone that can enjoy sugar cookies. First of all – so easy. No chilling time, no rolling and cutting out the dough, no detailed frosting work required. In short, they’re pretty much the easiest sugar cookies known to man. Plus, they taste amazing. They’re soft and chewy and perfect. And I even liked the frosting. I don’t really know who this is talking right now, because it can’t be me. This Swig sugar cookies recipe makes a huge batch of cookies, and the cookies themselves are really big. I got 34 cookies out of the recipe and they were each huge. Although that’s not really a bad thing – you can be happy having just one that way! Anyone else totally incapable of eating just one cookie? With normal cookies, I just don’t think it can be done. Does anyone ever stop with just one? I think you always have two. Or at least I do. Maybe I just have no self control? I should probably work on that. Or just always make giant cookies! That way I’m good with one. I think that’s my new game plan. Swig sugar cookies. If you haven’t, you definitely need to try them. If they could convince me to like sugar cookies, you’re almost guaranteed to love them. Because you’re probably normal and loved sugar cookies (and frosting!) to begin with! Giant copycat Swig sugar cookie anyone? I think there might be one left. Probably not though. I actually liked these sugar cookies. I’ve also shared this Swig Sugar Cookies Recipe over on Food Fanatic. Could you roll these out, cut them with a cookie cutter and bake them like traditional sugar cookies? I haven't ever tried it but I think it would work okay. They do spread a bit when you bake them though so they may not hold the shape perfectly. I would roll the dough fairly thick if you want them to stay soft - these are almost 1/2" thick - so I don't know if you would want cut out cookies that thick or not? If you make them thinner you would need to decrease the baking time by a couple of minutes if you want them to stay soft. I also have this sugar cookie recipe that I know rolls out nicely and holds it's shape when baked, if you prefer! If you try it with this recipe, let me know how it turns out! I rolled them out and cut our halloween cookie shapes and it worked just fine. You do have to be careful picking them up and moving them to the pan. It is crumbly and they can break. So just be careful and use a spatula. I have been meaning to try these cookies for ages and FINALLY made them this morning, yes, started at 6am! OMG these are delish! Hubby gave them a thumbs up since his mouth was full with cookie. I made these cookies with my 13 yr old son and they turned out amazing! One of the best sugar cookies I've ever had. Soft and delicious. I did add a 1/2 teaspoon of almond extract along with the vanilla. Couldn't have been better! I've now made this recipe twice. They make really great sugar cookies, but I never get the pretty rough edge for some reason. :( I weigh all of my dry ingredients - do you think that could be the problem? Maybe not enough flour doing it that way? I'm not sure - I get 5oz per cup of flour so maybe if you use 4.5oz per cup that could be the problem. Or if you're using a larger cup to press down the dough? When I press down with the glass dipped in sugar, it gives the flat middle and the rough edge where the dough presses out around the glass. Is your glass covering the entire cookie when you press it down? If so that could be the problem, and you would just need to use something smaller to press them. Hope that helps! When you press your balls, does any spill out? The part that pushes out from under your press or cup comes out with the jagged edges. Yes, I make sure to use a cup that is small enough to have the edges spill out so that I get those jagged edges. Then I put the frosting in the middle flat section after they cool. Do you have to refrigerate them after they're already made? They do stay soft even in the refrigerator. The original "Swig" cookies are served cold which is why the recipe says to keep them in the refrigerator. I frosted all of mine immediately, and there's sour cream in the frosting, so I think that you would want to keep them in the fridge if they're frosted. If you're not going to frost them until you serve them then they would be fine at room temperature. Okay great! I'm traveling to see my family so I'll just frost once I'm there. Thanks Again! 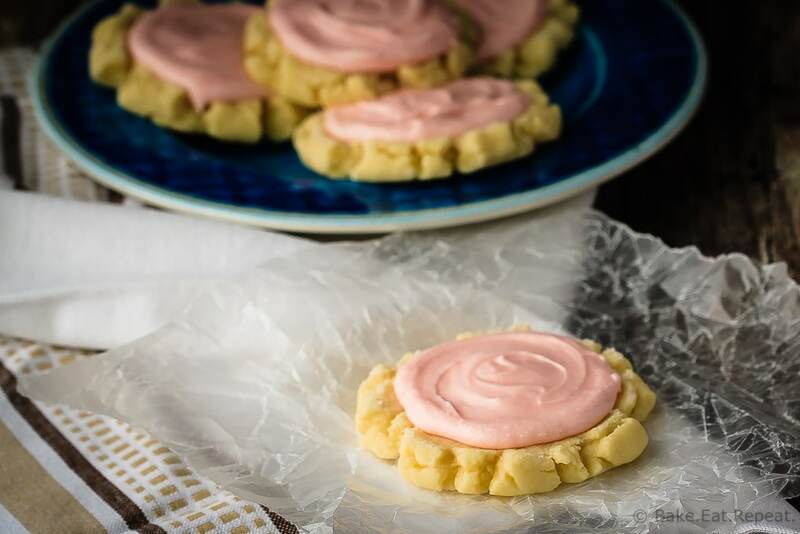 I've had the Swig sugar cookies when visiting my sister in Lehi, UT. Can't wait to try this recipe and compare with the delicious originals. How long do the cookies stay fresh in the refer? Do they freeze well frosted/unfrosted? Hi Stephanie - we had these cookies in the fridge for about a week and they were still great at that point. I haven't tried freezing these ones yet, but I think it would be worth a try, most cookies freeze just fine. I'm not totally sure about the frosting on these ones as I've never tried to freeze this type of frosting, but it makes a large batch so I'll probably be trying it at some point! 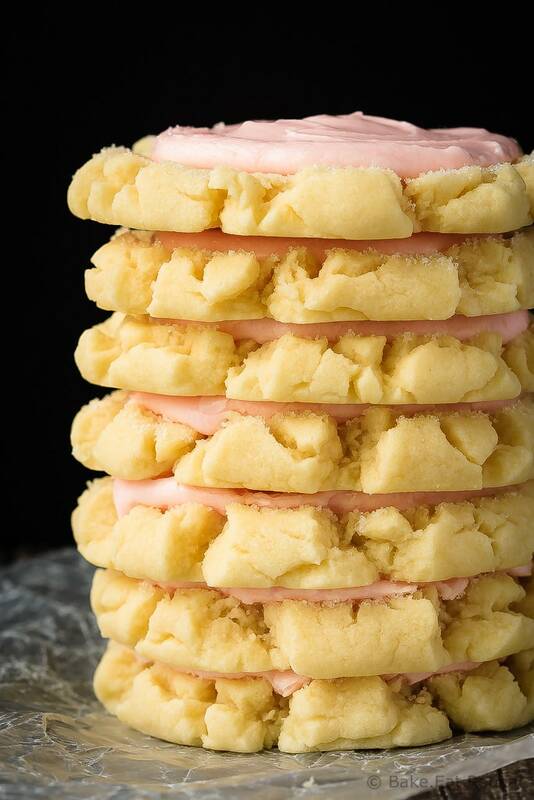 There's a cookie shop in St. George, Utah called "SWIG" that has these famous sugar cookies. So this is a knockoff recipe of those. I've never had the originals, but there are lots of copycat recipes out there and this is an amalgamation of a few of them.